The ocean is filled with alien-looking creatures, a lot of natural beauty and a crap ton of garbage. There is so much garbage in the ocean that fully formed patches of our filth have spawned. In this fascinating visualization, NASA reveals how the ocean’s 5 islands of garbage came to be. You can see the swirling pattern of the ocean cause a natural graviation of garbage to each other as they settle down in different parts of the world. ...If we let all of the buoys go at the same time, we can observe buoy migration patterns. The number of buoys decreases because some buoys don’t last as long as others. 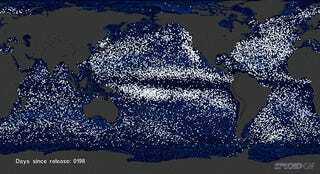 The buoys migrate to 5 known gyres also called ocean garbage patches. Read more about the five garbage patches and how they formed here.